Heat oven to 425°F. Spray jelly roll pan, 15 1/2x10 1/2x1 inch, with cooking spray. Mix parsley, marjoram, thyme, garlic salt and pepper. 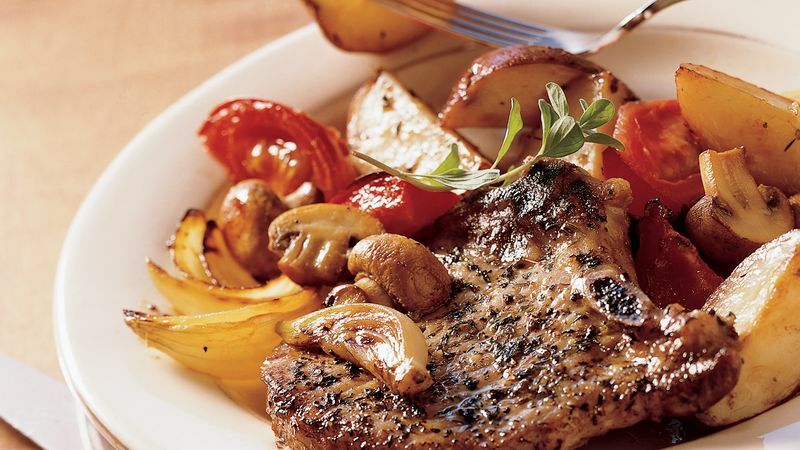 Spray both sides of pork chops with cooking spray. Sprinkle with 1 to 1 1/2 teaspoons herb mixture. Place in corners of pan. Mix potatoes, mushrooms, bell pepper and onion in large bowl. Spray vegetables 2 or 3 times with cooking spray; stir. Sprinkle with remaining herb mixture; toss to coat. Spread evenly in center of pan between pork chops. Bake uncovered 45 minutes. Turn pork; stir vegetables. Place tomato wedges over vegetables. Bake uncovered 10 to 15 minutes or until pork is slightly pink when cut near bone and vegetables are tender. Love veggies? Add sliced carrots, zucchini and a variety of bell peppers with the potatoes. Serve with a crisp salad or fresh fruit and hearty bread to round out your dinner.